Time for another round of 'What I Ate Wednesday'. Don't miss the sugar-free slice at the end! Breakfast: Banana pudding breakfast parfaits. I pinned this from 'Yeah...I'ma eat that' and made it for breakfast this morning. The 'pudding' is made from oats, oat flour, milk and instead of peanut butter as Kylie suggests, I used my cashew, peanut and sesame nut butter. It is layered with banana and Greek yoghurt and is yum. And happily, quite filling. I made a white (cannellini) bean and tuna dip for an upcoming post and had some left over. 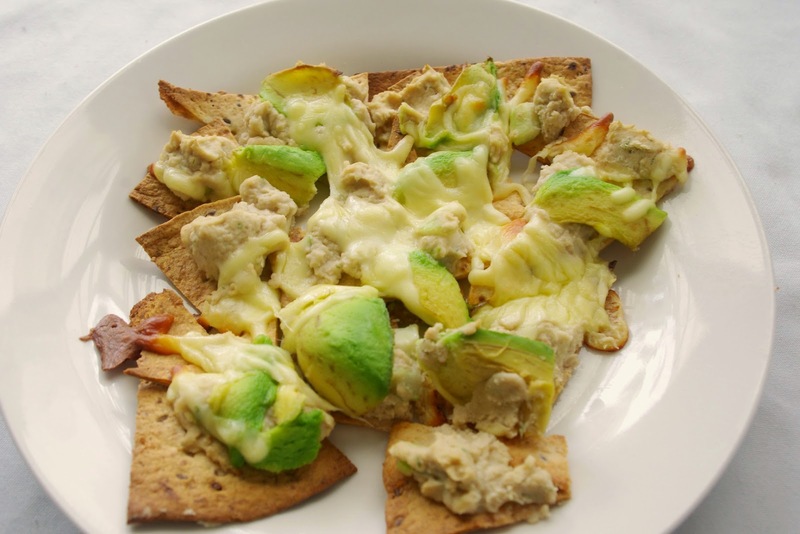 I also had left over nacho chips made from wholemeal tortillas so I layered them with the dip, avocado and mozzarella and baked them in the oven. The result was healthy, delicious and satisfying nachos. I finished the rest of the dip with a carrot while I was waiting for the nachos to cook. 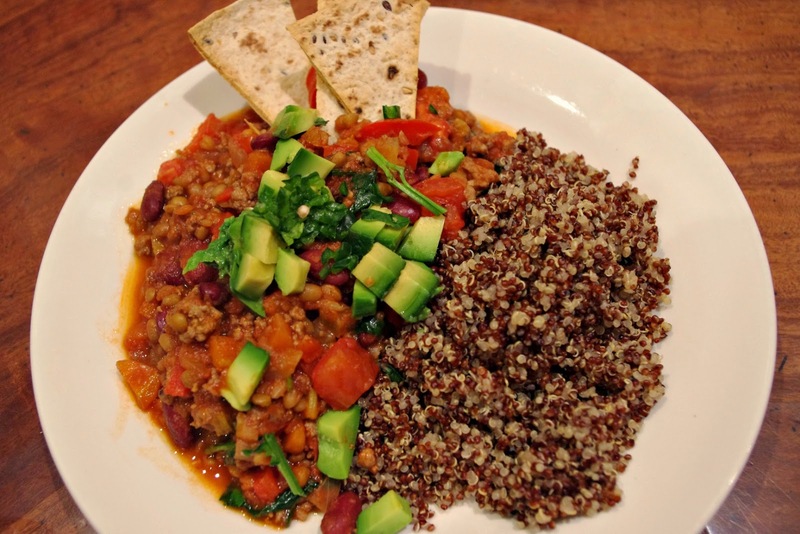 I made The Healthy Chef's Chilli Con Carne and served it with quinoa. Hubby is slowly converting to the quinoa side especially since he realised how well it's nutritional stats stack up when compared to brown rice. This is the red and white quinoa from Costco. It is cheap ($19) for 1.8kg, organic and is PRE-RINSED!!! I normally get just white, but they didn't have it in stock, and this tastes very similar. 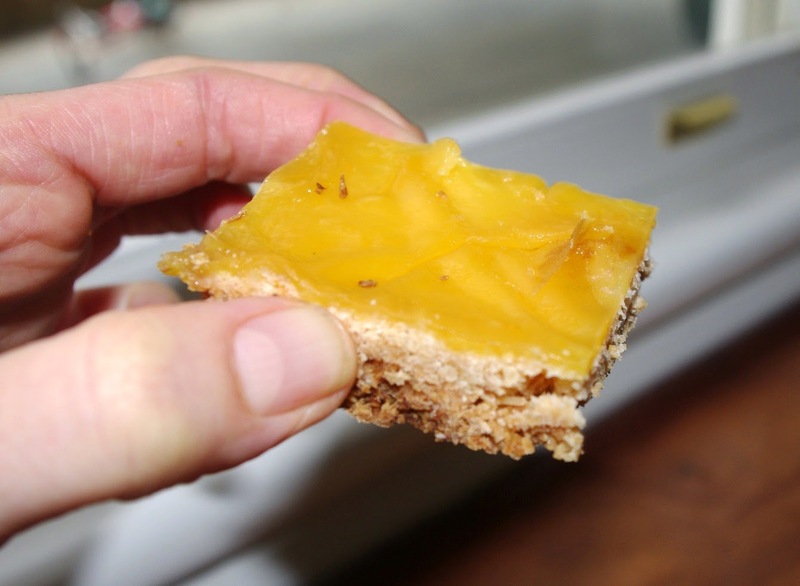 This is based on Style and Stuff's Passionfruit Slice posted on facebook via Natvia. It is tart and sweet and I have big plans for the lemon curd in an upcoming dessert. Snacks: Mum and Dad took myself and the grand kids out for afternoon tea. I didn't get a photo and can't remember the brand (and Google couldn't help me, what the??) but it was a French Vanilla Macadamia Nut Milk. It was vegan, organic, cold pressed and used banana and dates as the sweetener. It was great to have a new drink that tastes like a treat without all of the sugar. So tell me, what is your healthy treat when you go out? Pre rinsed quinoa is the best haha. I don't know why I hate rinsing it so much but it just feels like such a hassle! Hearing you Liz, it really annoys me too! I was so excited when I saw it was pre-rinsed!! I gotta get my hands on some pre-rinsed quinoa lol! Those nachos look amaaazing! What a great combination! 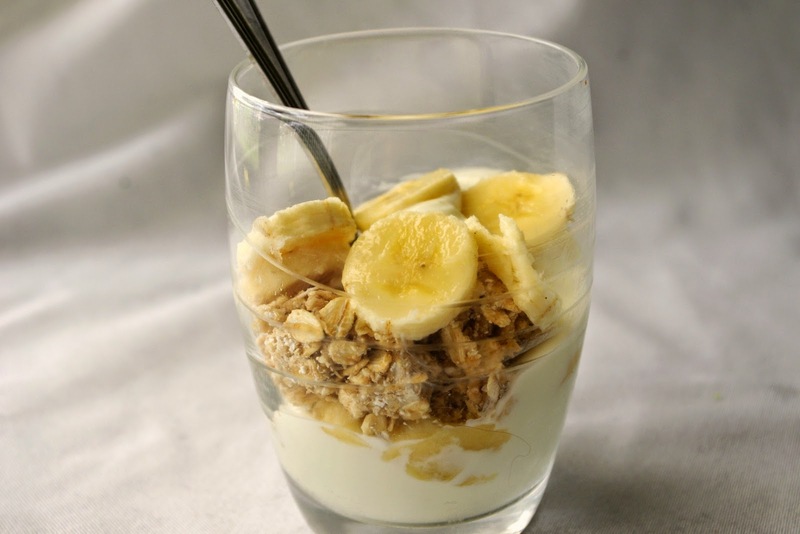 I just LOVE the Banana pudding breakfast parfaits. The parfaits are yummy I'd recommend you give them a go. I'm making one with buckwheat and cashews tomorrow, hopefully it tastes just as good.